Over the years I've played Checkers, Chess, Go, Chinese Chess, Backgammon, and countless other abstract board games of skill. Checkers has won out over the others. I think I know why that's happened. It isn't just that checkers is an elegant and subtle game of great depth and unending challenge. I think it's also that I learned the game from my father, of blessed memory, when I was very, very young, probably three or at most four years old. In a way I feel that I honor his memory by playing his game. Dad was what you call a "regular" guy; he was a blue-collar worker, his drink of choice for many years was beer, he watched a lot of television and could never be thought of as "intellectual." But I learned a great deal about many, many things from Dad; things like being honest and decent, being self-reliant in tough times, not wasting your life being angry, and a whole lot more. But one of the things I learned from Dad was checkers. I never was able to beat Dad at checkers. He was not a "book" player and couldn't tell me about The Old Fourteenth or Payne's Draw. His favorite openings were the Edinburgh and the Double Corner but he didn't know them by name. Yet he never missed a shot or combination, some of them quite complex. He instinctively knew about formations, and he played the endgame well. He had his own way of teaching. When showing me how to win with two kings against one, his comment was "Ya gotta make a bridge." And with three kings against two, "Ya gotta trade 'em off first." As I got a little older, like six, I wanted to play chess. I tired of checkers, played on only half the squares and with only one type of move. As I reached teen years, as a fairly serious chess player, I became disdainful of Dad's "simple" game that "didn't require much intelligence." But I found that despite my self-proclaimed "intelligence" and "sophistication" I still couldn't beat Dad at checkers. What a lesson there was there, if only I had seen it at the time. But I set checkers aside for almost 50 years, and there is no doubt that the loss was all mine. Dad in turn had learned checkers from his father, who passed on before I was born. Grandpa Benjamin ran a tavern in Newark, New Jersey, in the 1930s and 1940s, during the last of checker's golden days. He apparently was a checker player of considerable skill; just as I couldn't beat Dad, Dad said he could never beat Grandpa. 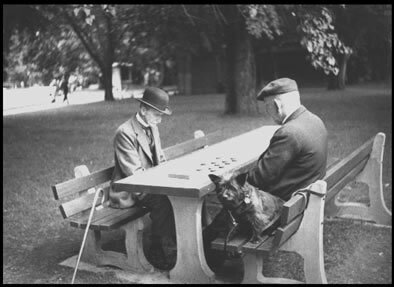 Grandpa liked to play for what was high stakes in those days; I recall Dad saying that Grandpa played some games for as much as five dollars (think about how much money that was in the 1930s). I also heard that Grandpa didn't lose very many bets. Family members told a story about Grandpa, that one day "this champion" dropped in at Grandpa's tavern and Grandpa took him on for a substantial amount of money. Whatever was the case, "this champion" perhaps didn't take Grandpa seriously enough, and Grandpa won the game and the large stake. Supposedly "this champion" was pretty unhappy. From what I can figure out from the date, place, and description, Grandpa had defeated Willie Ryan over the board, at least if the story is true. I greatly doubt if it is a true story, and it seems highly unlikely indeed. But one thing is certain, and that is that Grandpa would not have hesitated for a minute to take on Willie or anyone else who would play for the right stakes. In any case, I'm glad I've returned to Dad's game of checkers, though it is decades later. There are many lessons to be learned from this game, and even if belatedly, I can see that clearly. My checker web pages have produced a response that I never would have thought possible. Through these pages I've met people from all walks of life: from a fireman in Texas to a New England master craftsman to a mom looking for a nice checkers set for her son (who had survived brain cancer and took up checkers afterwards). I've heard from people both ordinary and extraordinary and they have all been great folks who shared an interest in checkers. As I mentioned on my companion page, Rediscovering Checkers, checkers is often called "country chess" or "poor man's chess" or "chess for the rest of us" or some other belittling name. It is thought of as simple, for children or old people only, and not a serious game. As someone once said to me, "It's only checkers." No big deal. Not important. This is all so incredibly wrong, and it comes from the elitist idea that Chess or Go is an intellectual endeavor, while checkers surely is not. After all, just about everyone knows how to play checkers, so how can it be elite and intellectual? This attitude is, in my opinion, an insult to the common man, who, though he makes our nation great through daily hard work and a high standard of decency and honesty, is to be denied any pastime which smacks of intellectuality. If the common man plays checkers, then perforce checkers cannot be intellectual. After all, how can anyone who drinks beer be interested in something that exercises his mind? Let me draw a somewhat unexpected example from another part of our planet, which completely refutes this "I'm better than you" attitude. There is a clear relationship between checkers and Chinese Chess (Xiangqi). Xiangqi is played by millions and millions of people in China (and Viet Nam and elsewhere). It is definitely a game played by the common man, woman, and child. Soldiers play it in spare time. Children play it at school. It is played almost universally at a high level of skill. Does this mean that Xiangqi is a "simple" game and the Chinese equivalent of "country chess"? Hardly! It's a very deep and complex game. And, given the lack of general availability of books to the common person, it's taught a lot like my Dad taught me checkers, through proverbs ("ya gotta make a bridge") and through practice. Xiangqi is played with pride by the common man, who takes deserved pride in this intellectual achievement. Looking down on checkers because it's played in firehouses in Texas and on cracker barrels in Alabama is making the same kind of error as looking down on Xiangqi because Chinese soldiers play it in their camps. It's misplaced elitism that doesn't even have any truth at the core. The simplicity of the rules of checkers has made it accessible to all, but that doesn't make it a simple game. 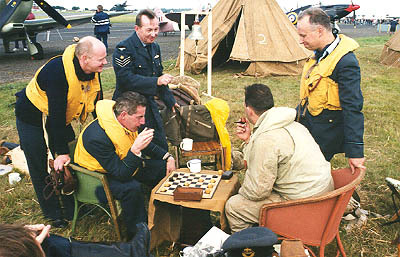 Checkers is an intellectual exercise, that can be enjoyed by everyone, at whatever level of skill one cares to achieve. 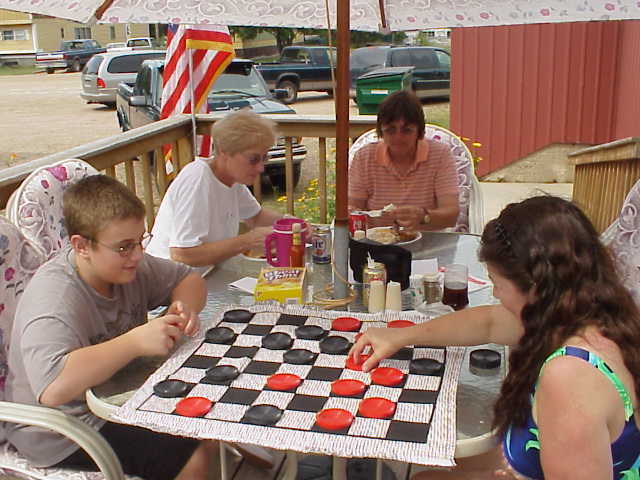 The enduring greatness of checkers is that it is a mind sport for the common man. Checkers is all about real people and real life. The following sage and homely aphorisms were provided by Russell G. Waldrop of Waynesboro, Virginia, who is most definitely a real person, and are used with his permission. Russell also learned checkers from his Dad, and couldn't beat him either. 1. The best players have experienced losses. 2. We can learn more from losing than from winning since winning brings a blinding euphoria. 3. Everybody wants to be king. 4. Sometimes it's better to sacrifice one's self so that others can become king. 5. Kings make bigger targets. 6. We don't become kings all alone. Others either blocked, jumped, lined up, or made the ultimate sacrifice so that we could. 7. Jumping into and out of kingdom on one move may prove too dizzying for personal safety. 8. If you don't show up on time for your move, you could lose the game. Bob Newell, Santa Fe, New Mexico. Last revised 5 June 2004.